Customer surveys are underrated entirely, when in actuality they are so beneficial to other customers, and even businesses as a whole. What’s better than getting feedback from customers on the web letting you know how well your company is doing? On the other hand, it can be nice to get criticism and learn what you need to work on to make it even better. It’s all about gaining feedback and making improvements. So how do you make an effective customer survey for your own business? It’s all right here. For starters, one of the best ways to conduct a survey is through email so that will be shown throughout these steps as well. Make Your Goals Clear- First thing you need to do is define a goal and figure out what you want to get out of the customer survey. Are you looking to improve a product or certain service in your business? Write this down in a few sentences. Choose Your Survey Tool- There are different sources where you can get a survey maker. Most customer surveys are made through Survey Monkey. Alongside Survey Monkey, there is Vertical Response which you use through this. Vertical Response is great if you’re shooting to generate a survey that can be sent out through email. Templates- When using a survey generator, you often get to choose templates that go with what you’re aiming for. They can be based off of your company’s needs. Templates also save you a lot of time in the long run, when you might have other things going on. Logos- Adding in your company logo is important. It makes the survey look more professional and it just overall adds more style. You can add in your company colors as well to make it look even nicer. Create A List Of Questions– Now that you have some things out of the way, it’s time to brainstorm a list of questions for your survey. It’s important to keep in mind that you don’t want to persuade your customers through this survey, keep the questions very open. Also, be sure to go back to your main goal for the survey, and make sure that the questions will in turn give you the feedback you’re looking for. Lastly, be sure to ask enough questions, but not to many.Ten would be the perfect amount. 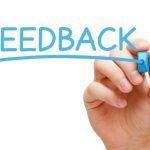 REVIEW- It’s extremely important that you review your survey before you send it out for people to see. You don’t want to have any errors in spelling and it’s best if you check it over one last time to see if you want to make changes. Grab Customer Attention- Here, you’re going to want to come up with a subject line to add to your email when you send them out to customers. Basically, the subject line is just asking them to take your survey but in a professional manner. You’ve probably seen examples such as, “Take our 3 minute survey and win a gift card.” Or, “Take Our 2-minute Survey and Tell Us What You Think.” You need something to grab attention. Create An Invitation- Writing the invitation for the email is not very hard at all. Be sure to thank the customer for choosing your company and politely offer a survey for them to take. Be sure to add details about the survey as well, such as what it’s for, what the survey is aiming towards, and end it with a closing statement and thank you. Sending Out Emails- Next, you’re going to want to do is pick and choose who your survey is going to go to. Usually when someone purchases a product from your company, or signs up for the mailing list obviously, you then have their email address and you can choose to send out the survey to them. If you company offers products and someone recently bought something from you, it may be best to offer a survey to them so you get instant feedback. Reviewing/Collecting- One of the last things you want to do before you send out all of the surveys, is send a copy to yourself and make sure everything works. Once it comes back with no problems, you’re good to go! When you receive feedback you can start collecting data and moving forward with your business in looking for ways to make it more successful! There you have it! A full ten step list of how to create an effective survey for your customers. Hopefully, you found this beneficial to you, and you can go on using it in the future for your own needs!